In this post we'll get started building a web app using Ruby on Rails and SQLite. In a nutshell we'll be building a shopping cart app with a little twist. I do a lot of work for Medisend International, which is a non-profit that ships medical supplies to developing countries (among other things). They have an (old) international aid self-service portal that allows aid recipients (typically hospital administrators or local NGOs) to create a shipment and select medical supplies to be shipped to their country. We'll be building a replacement with Ruby on Rails. Before you get started you might want to go through Get Started with Rails which has a lot of great stuff. I'm only using a subset of the functionality outlined in this guide so you'll definitely want to go through this entire article. I'll zip up all of the code for this part so you can download it and pick it apart. 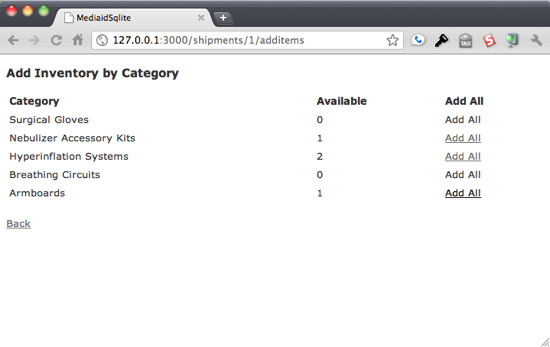 So now we have our database setup and the basic functionality generated for us by Rails. Some people don't like the scaffolding and prefer to code from scratch but I'm going to simply modify the code generated by the scaffolding. The application consists of essentially 6 view and one controller. We'll look at the views first and then dig into the controller. 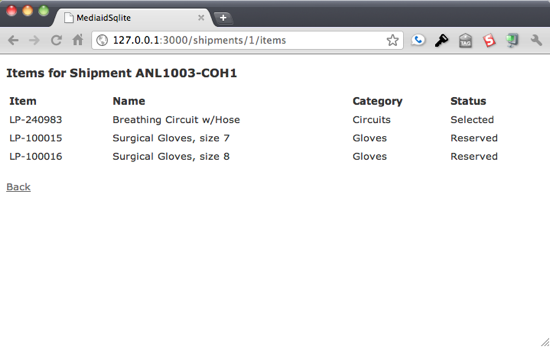 This page is where most of the work is done for a shipment. 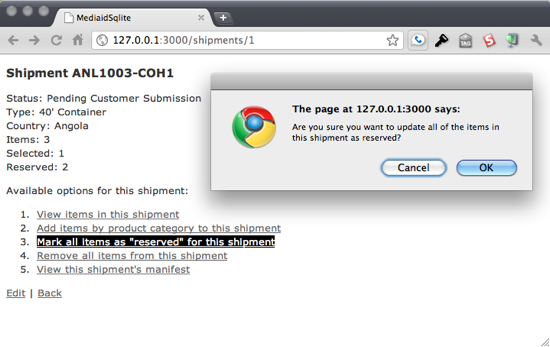 It provides the relevant info on the shipment and allows the users to manage the shipment's contents. Items that have been added to the shipment need to be marked as reserved so that they can be processed for shipping. Clicking "OK" runs the reserve route to mark the items in the shipment as reserved and then redirect the user back to the shipment display page. Users may want to remove all of the items from their shipment and begin the process anew. 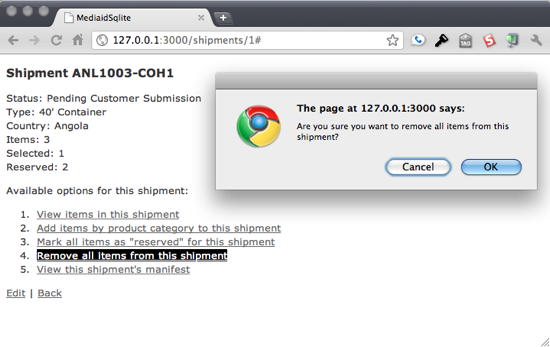 Clicking "OK" runs the remove route which removes all of the items from the shipment, making them available again, and then redirects the user back to the shipment display page. Last but not least is the ShipmentController. Controllers provide the “glue” between models and views. In Rails, controllers are responsible for processing the incoming requests from the web browser, interrogating the models for data, and passing that data on to the views for presentation. Take a look at the following code which should explain quite a bit. Since the controller contains code both generated by Rails and added by me, I've annotated it for your viewing ease. That's our application in a nutshell. You can download a zip of the entire project from here. In the next part of the series we'll dive into the Force.com Toolkit for Ruby and really start to integrate with the platform.